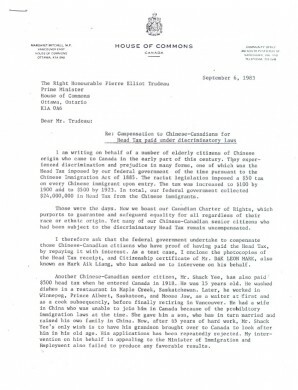 This gave rise to the first Charter challenge to the Government of Canada on its handling of discriminatory laws against Chinese, and a demand for financial compensation, plus interest, for the head tax (see interview with Mary Eberts). But the campaign for redress had begun years before this 1999 court challenge. 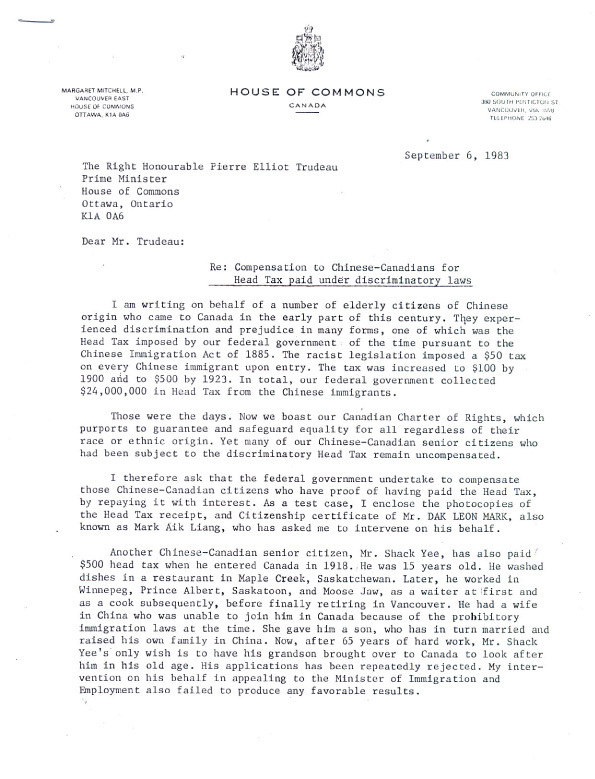 Inspired by the enactment of the Charter, in 1983, two elderly Chinese head tax payers, Dak Leon Mark and Shack Yee, approached their Member of Parliament Margaret Mitchell (Vancouver East) to ask for assistance in getting a refund and redress for the $500 head tax they both paid to enter Canada. Mr. Mark, also known as Mark Aik Liang, had proof of payment with the head tax certificate he was given as a receipt, and additional citizenship paper, that he provided to Ms. Mitchell to be included in a letter dated Sept. 6, 1983, to then Prime Minister Pierre Elliot Trudeau . Mr. Yee, on the other hand, paid the head tax when he landed in Canada in 1918 as a 15 year old. He washed dishes to earn his keep and also worked as a waiter and cook in cafes in Saskatchewan and Manitoba before retiring to Vancouver. At some point, Mr. Yee found a wife in China and they had a son, but because of the exclusion laws in Canada at the time they were unable to bring him here. His son went on to raise his own family, and Mr. Yee had tried to sponsor his grandson to immigrate, but was turned down. Both men asked Ms. Mitchell to help them recover their costs, plus interest, as well as try to sort out Mr. Yee’s immigration problem. In February, 1984, Ms. Mitchell raised the issue in the House of Commons, sparking a campaign by the Chinese Canadian National Council (CCNC) to survey the community and demand an apology and redress for the effects of the Chinese Immigration Acts. More than 4,000 head tax payers, their spouses and descendants registered with CCNC and its partners across Canada to lobby the federal government on their behalf.